Boulder, Colorado is one of the world’s outdoor meccas, home to legendary trails, climbing walls, creeks, whitewater rivers, mountain bike paths, and iconic views. The city is synonymous with adventure, offering thrilling experiences that are difficult to find anywhere else. A group adventure tour in Boulder will take your team to literal new heights, exploring some of the iconic places that make the city famous, from the Flatirons rising high above Chautauqua Park to the rushing waters of Boulder Creek, and the rolling hills of South Boulder and the Switzerland Trail. Our goal with group adventure tours is to provide you with an adventure that’ll invigorate your team like nobody else can, teaching new skills, reliance on each other, and testing comfort levels as we explore personal and adventurous boundaries. 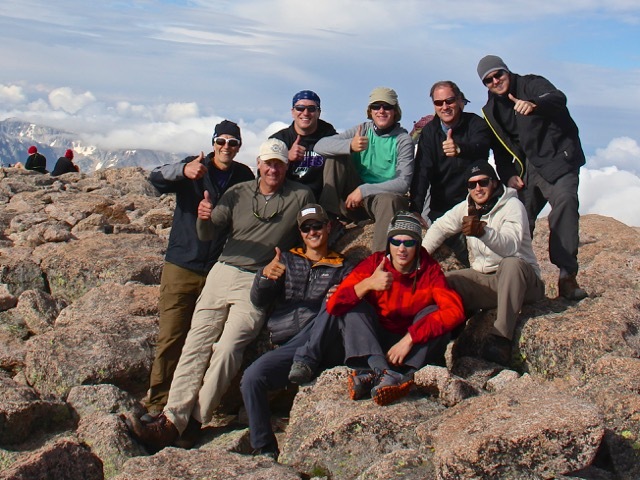 These are some of our favorite Boulder group adventure tours. 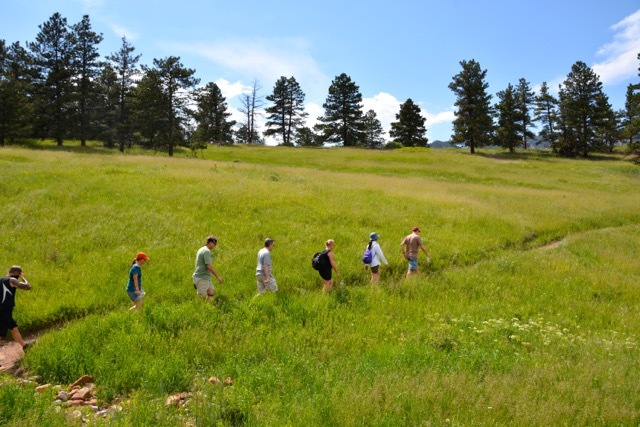 Hiking is a great way to explore Boulder’s local mountain parks, summits, rolling hills, and famous natural formations. From the towering Flatirons to the famed Royal Arch high above the city, we’ll choose a trail based on your team’s abilities and physical fitness and take you to see the best of Boulder’s sights deep on the trail behind the foothills of the Rockies high above Boulder. From the easy rolling trails of South Boulder and the Mesa Trail, to Mt. Sanitas, a local favorite with exceptional views high above Downtown Boulder, you’ll get to experience the city as only the locals do. After your experience, combine the day with a trip to one of Boulder’s local breweries, where we’ll get to sip and taste some of the best of America’s microbreweries. Want to take your hiking trip to the next level? Consider a trip at sunrise or sunset, where we’ll get to see a city in a way that even locals can rarely imagine. Take your team building to new heights. 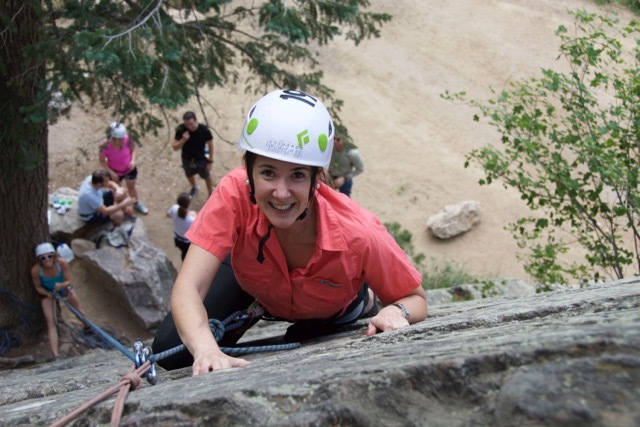 For many people, American rock climbing was practically invented in Boulder, starting with the pioneers of the 1960’s in Eldorado Canyon, and developing new routes and walls in Boulder, Clear Creek Canyon, Eldorado Springs, and Golden. With thousands of routes spread out through the Boulder-Denver area, Boulder is most well known for it’s famed rock climbers and climbing areas. Even for those who have never climbed before, climbing is an exhilarating experience, which takes climbers on some of the easier low-angle walls where we’re able to practice and learn basic skills and then take it one step further, exploring everything from challenging intermediate ascents, to some of the hardest and most thrilling routes in North America. Climbing is a great way to teach self-reliance, problem solving, encouragement among team members, and experience the sport that made Boulder famous. Come explore brand new heights with us. Join us for your next great Climb! Just like climbing, Boulder is home to world-class mountain biking trails for beginners and experts alike, honing the skills of generations of Ironman and Olympian athletes. From the rolling trails of South Boulder, the downhill, twisting turns of the Switzerland Trail, and the full-day tree runs of Magnolia, set on the edge of the Continental Divide, we’ll choose a trail that’s great for your team’s abilities and desires. For beginner and easier rides we’ll start at South Boulder where we’ll have magnificent views of the Flatirons and the Boulder Peaks, with the snowcapped Continental Divide rising in the distance. On the other side, we’ll be overlooking the city of Denver, Denver International Airport and the Eastern Plains. Catch momentum on the rolling hills and ride through exciting single and double-track trails through wildflower and grassy fields, smooth downhill turns, and open meadows. If you can pull a brake you can ride the Switzerland Trail. The Switzerland Trail follows the old trail, which took riders to the top of Boulder Canyon, overlooking the Continental Divide on one side and the City of Boulder on the other. From the top of the canyon, we ride through the trees on a combination of dirt and road, on fun, easy-grade downhill. After a long winding ride, we’ll come out onto the Boulder Creek Path, where we’ll ride back into downtown. For guests who are staying at the St. Julien or the Boulderado, this is an opportunity to ride right back to your front door. Riders who are looking for a more difficult ride will enjoy the full day tours through Magnolia. Set in Nederland, just an hour West of Boulder, Magnolia features exceptional tree riding through deep wooded forests, and exceptional mountain views. 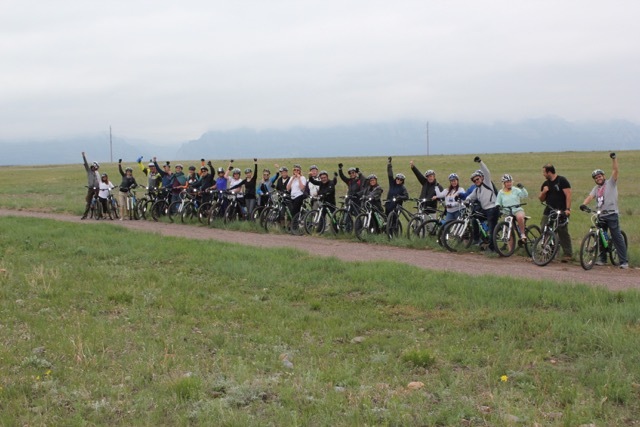 Magnolia is long and physical, ensuring a more physically demanding ride, but getting riders into the absolute best of Boulder mountain biking. This is a great ride for those who want to get deep into the mountains and explore what mountain biking in the Front Range is really about. With some of the best trout in the West, Boulder is famous for its fly-fishing ponds and streams, offering prize trout fishing and some of the best fly casting in Colorado. Fly-fishing is a sport that teaches patience and self-reliance, using careful skills and precision to get the perfect cast. Even for beginner anglers, it doesn’t take long to learn the basic techniques for wading and casting, before we get into the water and find pockets of brown, rainbow, brook, and lake trout. Our guides will find the best running stream or pond and then choose the right tackle based on the conditions, then after a short lesson on technique, will guide groups into learning to hook and reel. 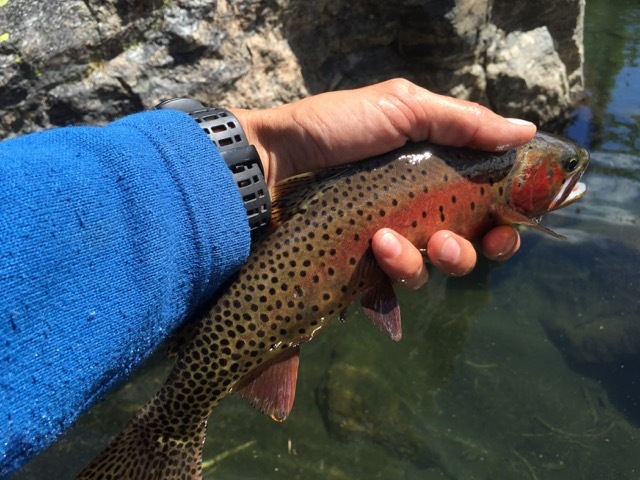 While the fishing is great anywhere, the best is at Boulder Ponds, which is just minutes away from Downtown in East Boulder, or travel up to Boulder Canyon where we’ll be able to find any number of hidden fishing holes up and down the canyon. Join us for this exceptional day of calm and relaxing fly-fishing. In the hottest days of the summer, get away from the city and explore the rushing whitewater streams of Idaho Springs and the Upper Colorado River, on a thrilling tour, which will take teams to exploring some of Colorado’s gold mining history as well as some of Colorado’s greatest landscapes. 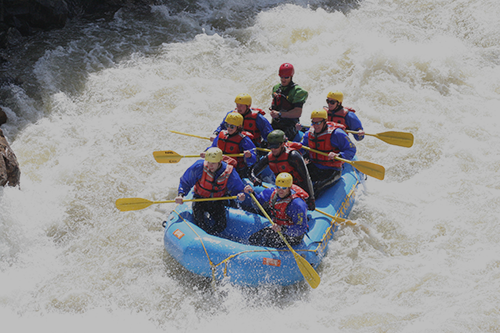 Even for those who have never rafted before, whitewater rafting is a thrilling and exhilarating experience, exploring Colorado’s deep gorges, passing the relics of Colorado’s mining past. For a shorter day we head to Idaho Springs, just an hour southwest of Boulder and Denver, deep in the confines of Clear Creek Canyon, riding through some of the old mining relics and waterwheels of the canyon. For longer days, we’ll head up to the Upper Colorado River, set in the red rock canyons and plains of Northern Colorado, near Steamboat. This spectacular landscape of high meadows, distant alpine scenery, desert-like ambiance, and great fly fishing makes this the perfect full day trip for any group. Along the way we’ll also get to experience cliff jumping, swimming, and hot springs, an added value to an already unique place. While the rapids here are mild, the ambiance is memorable and you’ll never forget a full day on the upper Colorado River! See Boulder from the relaxed and comfortable confines of our air-conditioned and heated vehicles, getting to experience big mountain views, wildlife, and facts and stories from Boulder’s colorful history. Sightseeing will take you to see the best of Boulder’s sights from Boulder Theater to Pearl Street, and high to the summit of Flagstaff Mountain where we’ll be able to overlook the City of Boulder and the Continental Divide. For an added value, see the city at sunrise or sunset, where you’ll get to experience the city in an ethereal light that only few get to truly experience. This is a great way to see Boulder with the best in comfort and style. Join us for your custom and private sightseeing tour! Our group trips are designed to unite your team and give them a fun day that they’ll never forget. To book your group tour today, visit http://www.coloradocorporateteambuilding.comor call 720 242 9828 to book!